In Fr. John Gerard’s account of his time in England under the reign of Queen Elizabeth, published as The Autobiography of a Hunted Priest, this sixteenth century Jesuit tells many remarkable stories—stories of his imprisonment and torture in the famous Tower of London and subsequent escape, the priest hunters who almost burn through his hiding place, and several remarkable healings through the sacrament of Extreme Unction. Less swashbuckling than some others, one very interesting account nonetheless deserves some attention. 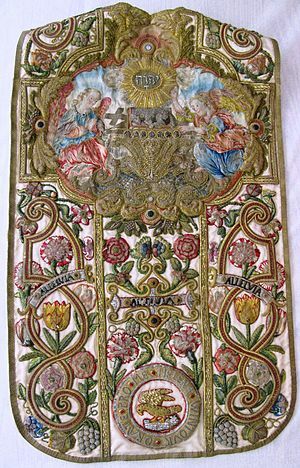 It describes the rich altar and votive offerings in the house of a wealthy recusant Catholic that he served for some time. I would like to consider this more closely because it offers encouragement to the effort of filling churches today with art that befits the worship of God. Since the church uses six colors of vestments, (2) Gerard is saying that this house had as many as twelve chasubles. This is incredible for a time when it was against the law to be Catholic! One thing I especially like about this set of “Popish Massing materials” is the sense of hierarchy: more intricate vestments and different crucifixes for the varying solemnity of feasts. This last item has the most remarkable ornament on it which was donated by the mistress of the house. It [the crucifix for great feasts] also had a precious ornament with the Holy Name engraved on it. My hostess had given it to me on the first Christmas after I came to live at her house. The Name was formed of pins of solid gold, and the surrounding “glory” had two pins in one ray and three in the next alternately. It…contained altogether two hundred and forty gold pins, to each of which was attached a large pearl. The pearls were not perfectly shaped (had they been, the value of the ornament would have been fabulous, but, as it was, the whole thing was worth about a thousand florins). At the bottom there was a colophon, worked in gold and gems by the artist, in the form of a monogram, expressing the Holy Name, and in the middle of this a heart with a cross of diamonds radiating from it. This was a New Year’s present from the devout widow in honor of the most Holy Name of Jesus, the day’s feast. Is this not marvelous? This unnamed host certainly knew how to express her faith through her wealth, supporting priests in many and various ways, making her house a center of Catholic resistance and refuge. The Autobiography of a Hunted Priest brings together two aspects of spirituality necessary today, namely, that the interior life with its prayers, consolations, and trials, must be the guiding principle for the exterior life; that the externals of our faith matter so much that even in time of persecution one should aspire to have the richest and most beautiful objects for the service of the Lord at His holy altar. As Pope Benedict XVI reminded us, nothing is too good, nothing too beautiful, for God, who is Beauty itself. This account of a stalwart Jesuit is good encouragement for traditional Catholics today who feel persecuted in practicing the Faith of our Fathers, even as the recusant Catholics of the sixteenth century did. All the Holy Martyrs of England and Wales, Scotland and Ireland, orate pro nobis! (2) White, red, green, violet, black, and rose. Gold is a seventh color, but it is not assigned to any particular occasions or feasts, replacing green, white, and red as a festive color.